Experts from Aarhus University, brought in by the Danish energy ministry, said they could not rule out the negative impact a project would have to a nearby bird sanctuary. The report from the university followed that of an earlier environment impact assessment released by the Danish energy agency in December, the energy ministry said. The EIA ruled the project could go ahead in a restricted area with some specific curative measures. As a result of the latest reports, Denmark has also had to delay the tender further, after a one-month postponement announced in March. This is to allow developers time to revisit their plans, which may be affected by the removal of Serjero Bugt. 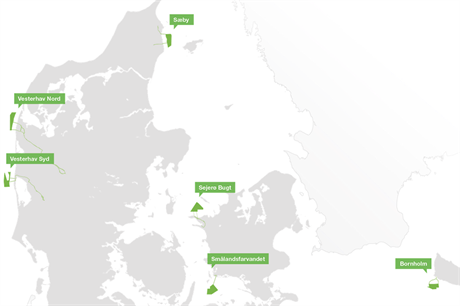 The tender of up to 350MW of wind capacity at now five other sites has been pushed back from 4 May to 1 September, the Danish energy minister said. "The green transition and set-up of wind turbines must not be at the expense of important natural and environmental concerns. Therefore, I am pleased that we now have a clarification. There will still be five other possible locations back in supply," said Denmark's energy minister Lars Lilleholt. The energy agency originally planned an auction for up to 350MW of capacity, across six potential nearshore projects. Three companies and consortiums were shortlisted for the programme: Vattenfall, a WPD-Hofor joint venture, and a European Energy-led consortium.